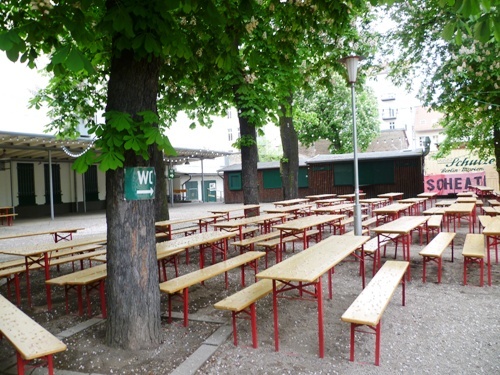 At Berlin’s oldest beer garden it is the first weekend in May, the flowers are blooming on the trees, but the shutters are most definitely down, behind which are locked beer taps that will not be flowing with Prater Pils. It seemed like the perfect time to head out for the first beer garden afternoon of the year. The skies may have been overcast all morning, and there is a slight chill in the air, but we have sipped beers in the rain here before, sheltering under those generous branches that provide shade on better days, or under the roof where they place the big screens for football tournaments. 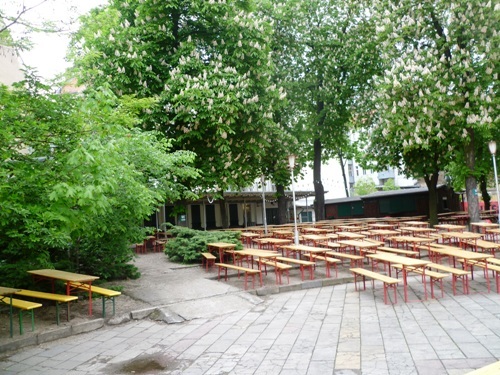 Luckily the Prater has a restaurant, and they are more than happy to serve us some drinks to take out into the beer garden which we then have pretty much to ourselves. 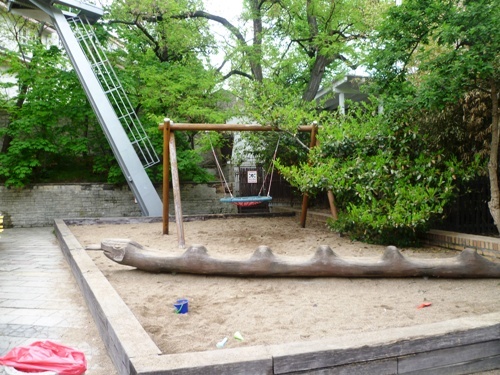 The kids do not have to wait for the swing in what is often both Berlin’s smallest and busiest “playground”, and we have our pick of the benches and tables. There is no sausages on sale, pretzels or pasta salad, but the burger place across the street is open and for once, there is no-one to object to us bringing in our own food. The first recorded political gathering was a party celebrating the foundation of the General German Workers’ Association. Set up by Ferdinand Lasalle in 1863, it was Germany’s first labor party. It marked its 8th birthday with a mixture of agitation, beer and dance music. There was also Dr v. Schweitzer’s play »Goose – A Dramatic Conversation on the Extension of the Female Job Market« (Eine Gans – Dramatisches Gespräch über die Erweiterung des weiblichen Arbeitsmarktes). In 1878 Bismarck’s social legislation banned all gatherings and celebrations that had an overtly political character. But the politically active proletariat started singing, sport and other cover associations; using Prater to continue their celebrations and agitations. 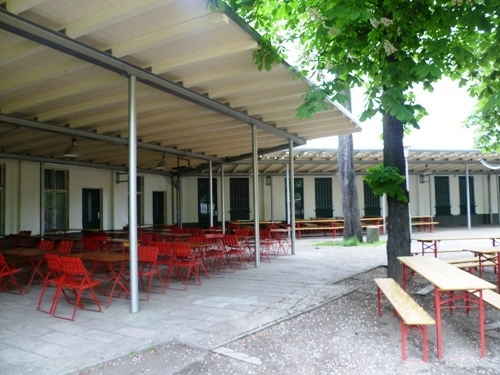 After 1891, the local on Kastanienallee became a central venue for the annual May Day festivities. 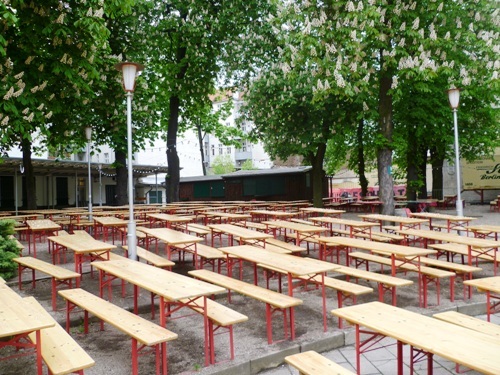 On this particular May weekend there was not much singing or sport going on in the Prater, let alone political discussions or the meeting of underground associations. Instead we have just the rustle of the trees and the conversations of the few hardy souls that decided they were here now, so they might as well have a drink. 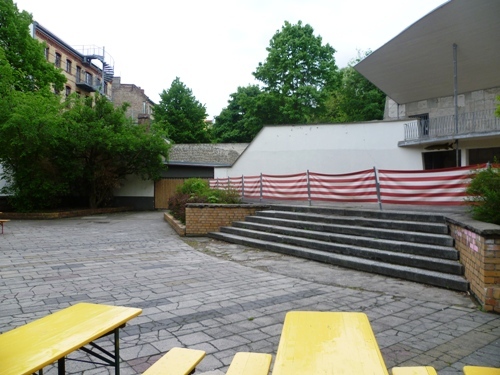 We will be back, when the shutters are rolled up, there are sausages on the grill, and perhaps even a game on the big screen, because this little corner of Prenzlauer Berg may be the oldest, but it remains one of the best beer gardens in a city that certainly has a few. This entry was posted in Beer, Memory, Off Season, Places on May 11, 2012 by Paul Scraton.